There is a Marine Corps air station in the Miramar area near San Diego. Every year there is a major military and civilian air show there. In Oct. 2002 we went to see this impressive air show in Miramar. Here are some pictures from this event. 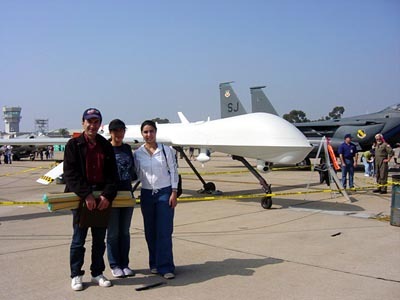 Ali, Saman and Saba with America's latest killing machine, the remote controlled Predator. In the back a F15. There were non-flying hardware on display too. 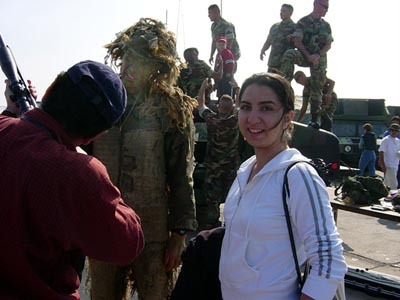 Here I am talking with a Marine sniper aboout his rifle, while Saba is minding her image. The bolt action rifle, according to the sniper, is a Remington 7.62 with a Leupold scope. The show was not limited to military hardware and skills. 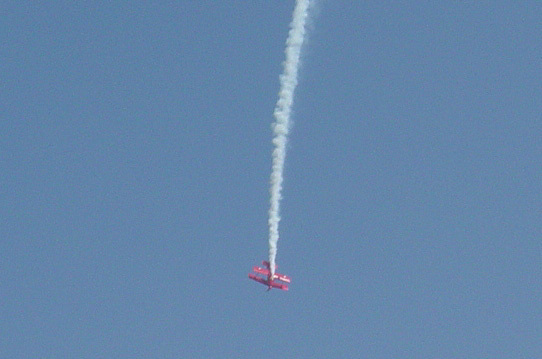 Some very good civil aerobatics were performed, including this one by the Oracle aerobatics team. The most interesting demo, however, was not done by an airplane, but a 'truck'. This is a truck with three jet engines which did 300 mph on the ground. Some good pictures of the 2002 show.